SAN DIEGO, Aug. 31, 2017 /PRNewswire/ — JPI, a leader in the development of Class A multi-family communities, has announced the close of construction financing for Jefferson Pacific Beach, scheduled to break ground this month. Jefferson Pacific Beach is a $103.5 million development with bay-front views, comprising of three-levels of podium construction on a nearly three-acre site. For decades, the land had been home to the former Guy Hill Cadillac dealership. PCCP, LLC a Los Angeles-based real estate finance and investment management firm provided the construction loan. Jefferson Pacific Beach will provide 172 luxury apartment homes, and 14,000 square feet of ground floor retail and creative office space. San Diego’s award-winning architectural firm, Carrier Johnson + Culture, created an innovative, leading-edge design, which includes unique amenities, such as a surfboard repair/DIY station, and watersport storage space. 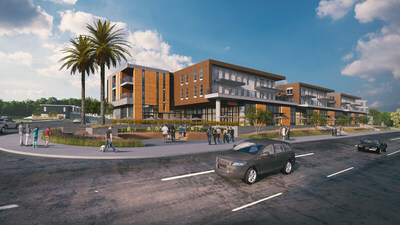 Jefferson Pacific Beach will soon be an iconic addition to one of San Diego’s most vibrant communities. In addition, the project includes upgrading seven existing traffic signals and the addition of one new traffic signal within the Mission Bay Drive corridor with an “Adaptive Traffic Signalization” system. This state-of-the-art system allows real-time traffic coordination to achieve more efficient traffic flow and will relieve congestion on Mission Bay Drive. JPI’s Jefferson Pacific Beach is located directly adjacent to Mission Bay Park. Developed from the 1940’s through the 1960’s, Mission Bay Park is the largest aquatic park of its kind in the country. It consists of over 4,600 acres in roughly equal parts land and water. Mission Bay boasts 27 miles of shoreline, 19 of which are sandy beaches with eight locations designated as official swimming areas. Annual attendance in the park is estimated at 15 million. JPI’s Western Region is based in San Diego, and has developed communities throughout the southwestern United States totaling over 9,400 units. Additionally, the Western Region recently announced the close of financing on two development projects in Anaheim. With the closing of Jefferson Pacific Beach, the Western Region has closed over $350 million in production this year, and currently has $600 million of production under construction in both southern California and Arizona.